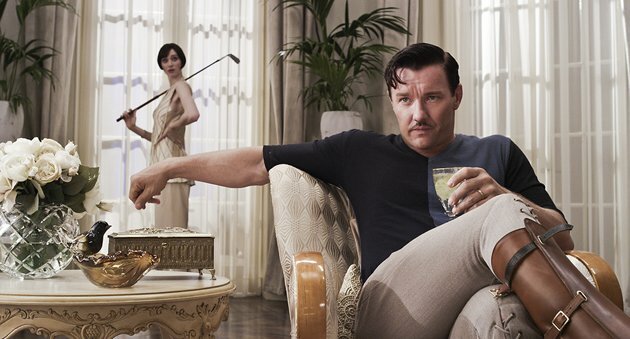 Baz Luhrmann’s latest, the fifth on-screen outing for F. Scott Fitzgerald’s novel The Great Gatsby, has finally landed. Sadly, yet inevitably, it has failed to live up to the hype built by a promising trailer and the hopes of fans. The film’s premiere at Cannes has drawn a plethora of hyperbolically scathing reviews, but it is fair to say that what should have been the film of the summer somehow manages to be just…okay. This version of Gatsby pulls together a great cast on paper – Tobey Maguire, Leonardo DiCaprio and Carey Mulligan – and is headed by the director who violently shook up the esteemed work of the Bard in Romeo + Juliet without incurring too much wrath. But this time there are plenty of reasons why fans of the source material should be less forgiving. Faithfulness in adapting well-loved literature usually deserves applause, but with Gatsby Luhrmann has proved that it is possible to be too faithful. Nick Carraway’s (Maguire) tale of the ever-hopeful (read: delusional) Gatsby (DiCaprio), and his pursuit of past love Daisy (Mulligan) receives almost no trimming in translation to the screen. Consequently, the first act’s introduction to the excessive alcohol-fuelled lifestyle of the moneyed elite in ‘20s New York proves a tedious opening to a film which becomes more enjoyable once the pace picks up. The mood could easily have been conveyed with a few establishing shots, but one benefit of the tedium is that it allows for incremental building of the myth of Gatsby, deferring DiCaprio’s arrival in the same way the novel delays narrating the meeting of Carraway and Gatsby. Luhrmann’s Gatsby is faithful in terms of content, but not style. Although it’s now a cliché to critique unnecessary uses of 3D, Luhrmann’s employment of the medium remains baffling. Despite the fact that he chose to shoot in 3D (rather than hastily converting in post-production) much of the scenery looks fake and shiny, and images such as dappled sunlight playing amongst the leaves of a tree lose shade distinction and become another wasted moment. Gimmicky devices like heavy-handed superimposing of lines from Carraway’s narration over the action seem to have been included merely for the sake of their appearance in 3D, yet they do nothing but clutter the film’s aesthetic. It’s only the – spoiler alert – car crash which warrants 3D, but even in 2D it’s likely to be the most visually powerful moment due to the employment of slow-motion and brutal sound effects, which also create shocking impact in Gatsby’s final scene. Even the performances are hardly mind-blowingly brilliant. DiCaprio’s turn as Gatsby feels familiar, and Mulligan was afforded better opportunities for exhibiting her talent in both Drive and An Education. Luhrmann and co-writer Craig Pearce’s Daisy is a little neglected, but the climactic hotel room scene does an impeccable job of portraying her entrapment between the egos of two men who won’t let her speak for herself. Of these men, the simmering violence of Daisy’s husband Tom (Joel Edgerton) is primarily more engaging than Gatsby’s lack of substance. DiCaprio’s best moment, and a high point for the film as a whole, is the dramatising of the ‘large request’ he makes of Carraway. 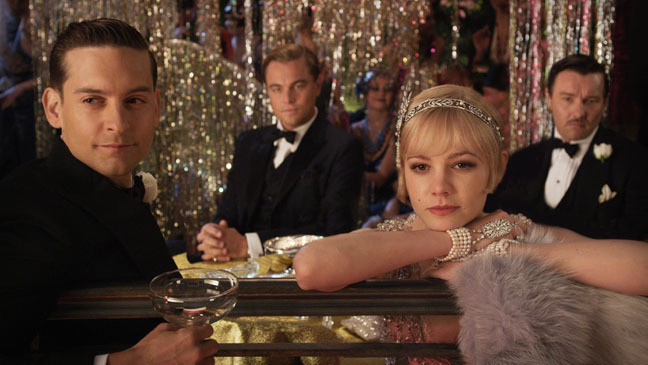 When Nick invites Daisy for tea, a ruse set up by Gatsby who is in attendance without Daisy’s knowledge, the film gets a comic lift which injects more fun than all of the party scenes combined. In this ensemble scene the actors collaborate to aptly portray the awkwardness of ex-lovers meeting after five years of near-silence, and Gatsby’s bumbling schoolboyish uncertainty is more charming than either his subdued schmoozing or the arrogance he displays later at the hotel. Tobey Maguire does an admirable job in a role which only really requires his voice, though if your ears have been treated to Jake Gyllenhaal’s reading of the novel Maguire may suffer by comparison. The peculiar use of Carraway’s narration is likely to divide audiences. Although Fitzgerald’s words are frequently used in voiceover, scenes of Carraway writing about his memories or speaking to sanatorium doctors are placed sporadically throughout the film. With this device Luhrmann finds an unhappy medium; the future is glimpsed too often to be a simple framing device, but not returned to enough that it isn’t forgotten while we’re watching the main plot. Such clumsiness extends to the film’s score, mainly provided by Jay-Z. Heritage and hip hop is a difficult blend to pull off, although Tarantino just about got away with it in Django Unchained. It rarely works here, especially in the case of a miniscule sampling of Alicia Keyes’ “Empire State of Mind” which is so ineptly done that it overlaps with Maguire’s voice over. Even Luhrmann seems almost aware of these failures, as in quieter scenes he opts for more neutral instrumental music. Despite the stylistic quirks which detract from rather than add to Fitzgerald’s story, Luhrmann’s is an adaptation sure to secure box office success but hardly likely to be hailed as a classic for anywhere near as long as its source material. This entry was posted in Film Reviews and tagged Alicia Keyes, An Education, Baz Luhrmann, Cannes film festival, Carey Mulligan, Craig Pearce, Django Unchained, Drive, F. Scott Fitzgerald, Jake Gyllenhaal, Jay-Z, Joel Edgerton, Leonardo DiCaprio, Quentin Tarantino, Romeo + Juliet, The Great Gatsby, Tobey Maguire. Bookmark the permalink.